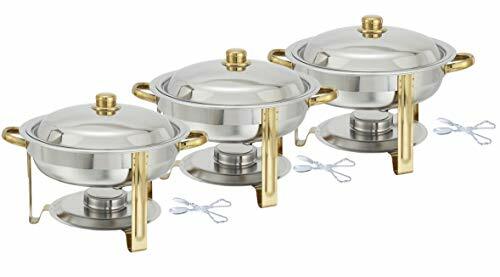 Maintain proper food temperature for the best cuisine with this heavy-duty 4-quart buffet chafer. Place your heat source in the fuel holder, install and fill the lower pan with water to evenly distribute heat, and place your food in the upper pan. Made with stainless steel for superior strength and corrosion resistance, Artisan chafers are available in a variety of sizes and styles to suit any occasion, formal or informal. 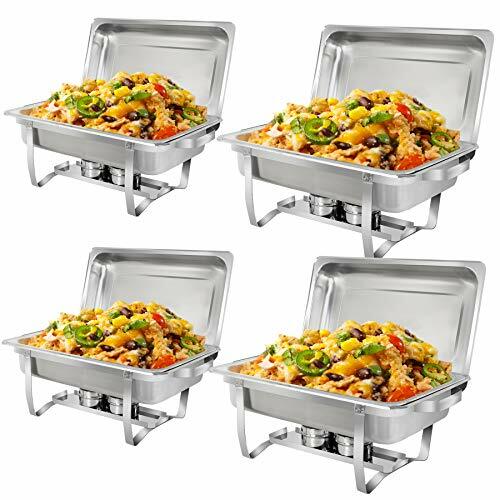 Great for buffets, potlucks, and other self-serve events, this chafer keeps food warm with a large pan and transparent lid with a steam release vent. This pack includes the welded rack, cover, water pan, food pan, and fuel holder measuring 13 inches in diameter and 10.25 inches tall. Hand wash with hot, soapy water and rinse thoroughly to clean. Dry immediately after washing. Avoid salt solutions or acidic foods and abrasive or harsh cleansers to preserve your piece's finish. Whether you are preparing small snacks, big meals and everything in between, great meals start with Artisan. 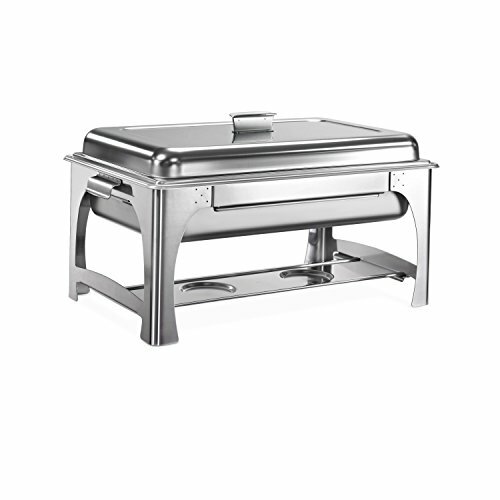 Made from stainless steel, this chafer is perfect for serving hot foods. 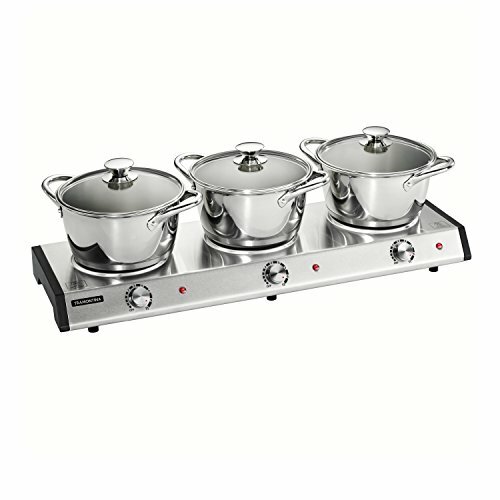 Tramontina's Triple-Hob Electric Buffet Warmer Set is practical, versatile, and ideal for keeping savory dishes warm for your guests when entertaining, and includes cookware that is compatible with all types of cooktops for your daily cooking needs. The set is perfect for large family gatherings, special occasions and holiday parties and features a sleek exterior and three 6" solid plate burners, allowing you to heat and serve up to three different dishes at the same time. Its three independent adjustable temperature knobs with variable heat control provides the option for selecting temperature settings most suitable for each dish. The Tramontina stainless-steel sauce pots included with the set are an excellent value and can also be used on any regular or induction cooktop, and in the oven up to 350 F (176 C). The cookware's tri-ply base construction provides quick and even heat distribution, and the riveted stainless-steel handles ensure comfort and added support. The glass lids allow you to monitor cooking progress when on the stove and helps guests to quickly identify the contents of each pot when used on the warmer. The cookware is dishwasher-safe and compatible with all cooktops, providing functionality and versatility for everyday cooking and entertaining. Tramontina's Pro-Line 9 Qt. 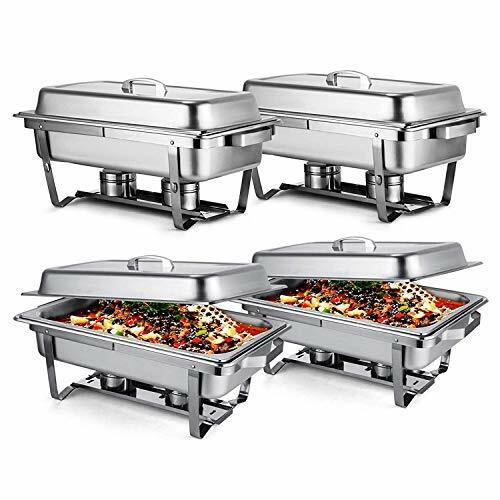 Chafing Dish is excellent for serving either hot or chilled food selections when serving food in restaurants, catering, or entertaining guests. Crafted with quality materials, Tramontina’s 9 Qt. commercial-grade chafing dish provides versatility with a stainless steel food pan that can be used to pre-heat food in the oven before placing in the chafing dish, or for serving chilled dishes on your tabletop. Food pan is NSF certified, oven-safe up to 390 F (198 C). Made in Brazil. 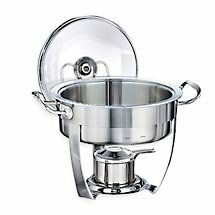 The Tramontina 4.2-Quart Stainless Steel Chafing Dish is perfect for keeping food warm and appetizing during parties and other social gatherings so you can entertain in style and ease. The stainless steel food pan can be used to pre-heat food in the oven before placing in the chafing dish to serve appetizers, side and main dishes. This versatile piece can also be used to serve cold food. The complete unit includes 4.2 qt. food pan, 6 qt. water pan with base, glass lid, chafing stand and lid holder.The unit measures 18.4" L x 11.9" W x 11.7" H.
Tramontina’s 4.5 Qt. 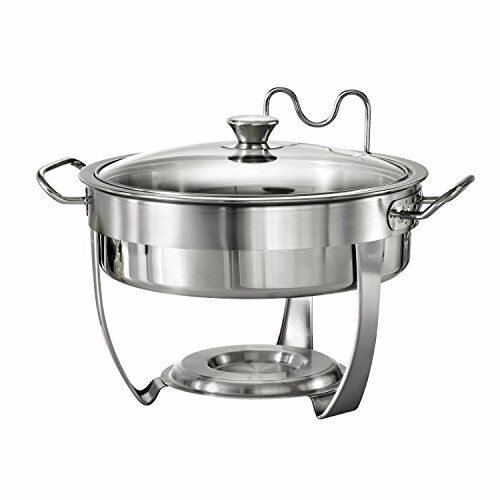 Stainless Steel Round Chafing Dish is an elegant way to keep your savory dishes warm and appetizing when entertaining your guests. 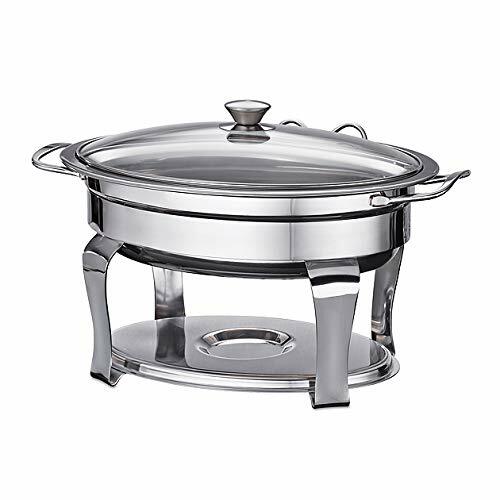 This chafing dish is excellent for warming and serving appetizers, side and main dishes, and is also great for keeping chilled foods cold. Crafted with quality materials, Tramontina’s 4.5 Qt. chafing dish provides versatility with an 18/10 stainless steel food pan that can be used to pre-heat food in the oven before placing in the chafing dish, and features a heat- and shatter-resistant tempered glass lid with a convenient lid holder. Made in Brazil. 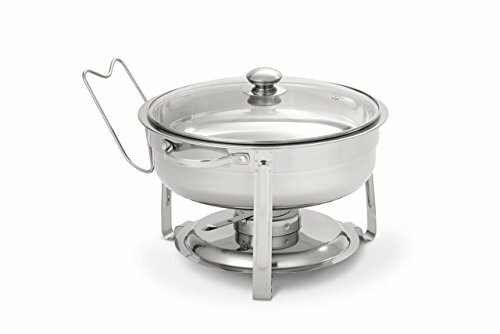 Compare prices on Tramontina Chafing Dish at LiveSaler.com – use promo codes and coupons for best offers and deals. We work hard to get you amazing deals and collect all avail hot offers online and represent it in one place for the customers. Now our visitors can leverage benefits of big brands and heavy discounts available for that day and for famous brands. We try to makes comparison shopping easy with Product Reviews, Merchant Ratings, Deal Alerts & Coupons. Find Deals, Compare Prices, Read Reviews & Save Money.